…and then joyfully open up your AdWords dashboard to play around with settings and statistics for the rest of the afternoon? As a matter of fact, if there’s ONE thing that overwhelms people when they’re building their first ad campaign, it is the somewhat intimidating AdWords interface. No offense Google, you know we love ya! And to be fair, Facebook’s Power Editor can be equally anxiety inducing! If you’re not really an analytic thinker by nature, you can surely have one of those “ummmmkay never mind” experiences when you first log in. So here we are…. Veeroll to the rescue! Our goal is to make everything EASY for you, from finding targets to creating videos as well building and optimizing your campaigns. That’s why today I’m going to zoom into the art of campaign building. And guess what, there’s actually not much of an art to it! I’m going to break it down for you in insanely specific steps. So much so that you just can’t go wrong! And, we even made a fancy little checklist for you to download. Click on the checklist and it will be sent to you immediately. This handy PDF will be your new best friend when you start creating your first campaign. What exactly are we building? In the past weeks, I’ve covered a lot on the topic of getting started. From niching down your target audience, to finding your targets in Veeroll, creating a compliant landing page AND creating a highly effective video script! The next logical step is to actually build your campaign with the Veeroll Campaign builder. First things first though, what exactly are we building here? Because yes, there are different types of (video) ad campaigns you can create with AdWords. Today, I’m gonna give it to you STEP by STEP! I know it sounds like a lot folks, but it really isn’t! In fact, they are all tiny – mini steps, just to get you familiar with all the details of campaign building that might otherwise confuse you. They’re not even all mandatory, but, I like to be thorough! And, after you’ve done it once you will fly through this process in no time. Make sure to also watch the video for a visual walkthrough! In the Campaign Builder, you can build your campaign quickly and easily. We’ve built this pretty interface so that you can postpone confronting the Adwords dashboard as long as possible! Just kidding! Well, not entirely. Because it surely helps to only see the settings you really need to see at this stage. Create a title that will not only make sense to you today, but also tomorrow and weeks/months from now. Especially if you start running more campaigns it can get messy if you don’t remember what’s what! Creating some kind of system for yourself here will surely help. So, what are your options here? Select the ad you’ve previously created inside Veeroll. When you create your video ad, it will automatically show up here for you to select it. Select your own video from your own youtube channel. If you want to use your own video from your channel as an ad, you can just enter the unique URL of the video right here. The Display URL is the root address of your landing page. For example, if your landing page is: http://www.awesomeyogamat.com/contest then you simply enter http://www.awesomeyogamat.com here. This is the address that your viewer will see. Your destination URL is where you’re actually sending your traffic to. The Destination URL needs to be on the same domain as your main website that you list in the Display URL! What the peep does UTM stand for you ask? United Terror Mafia? Unresponsive Tinder Match? UTM (Urchin Tracking Module) is a technology that allows you to track all your data. When you enable UTM’s in our Campaign Builder it will add some extra code at the end of the destination URL. You can enable this for advanced Google Analytics tracking, to collect data such as which targeting group or ad campaign sent you traffic and how many leads/sales you got from that traffic. 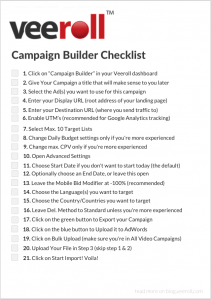 Check out this FREE Campaign Builder Checklist from Veeroll! Here you can select your targeting lists for this campaign. These targeting lists are the same as what Google calls targeting groups. You can choose 10. lists max. And for your first campaign, we definitely recommend choosing all of them. More targeting lists = more placements = a better chance of getting views. To get you started we’ve set your daily budget to 20 – something. “Something” meaning, whatever the currency is you’ve set up in your AdWords account. That means that, whatever happens, you will not be billed for more than an average of 20 dollars/pounds/somethings a day. We’ve set it up at 0.20 cents for you to get started. Now, when you’re in a more competitive niche, it could be that that’s not enough. And you might want to bid higher, for example around 0.50 per view. In the Targets tab of your AdWords interface, you’re able to see the Average CPV. for each placement your ad is running on. That means that you can easily get a sense if your bid is high enough or not. But hey, I’m getting ahead of myself here and am venturing into optimizing territory! I’ll cover more on that in the future. You’re still with me right? Ok, now simply click on Advanced Settings! Too easy. You could use a time window like this if you want to run an ad that is related to specific holidays for example or a limited time promotion of some kind. We’ve automatically set this to -100% for you. At the moment Youtube Instream ads are not yet clickable on mobile, which is the reason we’re reducing mobile impressions by 100%. There have been some recent changes to the options we have with mobile youtube ads, but I’ll talk more about that in the future. The default is set to English. Depending on who you’re targeting you can change this. Once you add a new language, you will automatically be able to delete the English one, in case you wish to do so. In many cases, you can get hyper targeted by not only selecting the right placements, but by combining this with geotargeting. You can do this in the Veeroll Campaign Builder to country level and even more specific in AdWords by choosing only regions, cities or even a radius around the location of your company. You could use this if you have a local business or if you want to try out some super specific targeting. For example, you could use “Hey, are you in Malibu right now?” for people in (D’oh!) Malibu. As long as you’re not using place names that are made up of swear words (just check Wikipedia for some entertaining examples) or use ridiculously long ones like Tweebuffelsmeteenskootmorsdoodgeskietfontein (who made THAT up?) you can fit it in your video script! Do note that getting turbo targeted means that you’re reducing your audience size and therefore your chance of getting views. So, only use this if it makes sense for your specific goals. This is set to Standard by default. When you leave this setting as it is, AdWords will aim to evenly distribute your budget across the entire day to avoid exhausting your budget early on. We’ve noticed in a few cases with campaigns that were too targeted, they seemed to get “stuck”. Meaning, the campaigns weren’t getting enough views. Changing this setting to Accelerated can sometimes work to fix this problem. However, if you’re just getting started don’t worry about it, and just leave it to the default setting! Oh goodness, we’re almost there! Time to export your campaign. This is as simple as clicking the bright green button “Export Your Campaign” and it will automatically download your text file. After green, comes blue (at least in this case)! Just click the button to “Upload it to Adwords”, which will automatically take you to your AdWords account. IMPORTANT: you can only upload the file you exported in the “All Video Campaigns” section, otherwise it will not work. So, if you ended up somewhere else, make sure to click on All Video Campaigns first! …click on Choose File to upload the file you obtained from Veeroll. Yep, all that is left now is to click Start Import! Your Campaign is Uploaded, Now What? Now did that feel like giving birth or what? Ok, I guess not. But it can surely feel like a weight off your shoulders if you were dreading getting started. Once you’ve done this a few times though, it’s really a matter of minutes. Google has to approve your ad, this usually happens within 1 business day. Until then, it will show as “not yet serving”. You can check this by looking at the Status column in the Ads tab of your Campaigns page. The actual first data has to come in, which can take about 24 hours. So, if your ad has been approved and you’re not seeing data yet, don’t fret! Do you have any Q’s for me to A or is anything unclear? Just leave a comment below. We’re here to help! And, if you’re not a Veeroller yet, make sure to sign up for you FREE demo right HERE.